Today's the Queen of England's birthday so I'm having a cup of tea in my fancy mug. I'm not going to lie, I totally got a jump start on the whole cool mug thing this time, luckily I saw Sarah with her Queen's birthday mug over on Instagram and wasn't going to be caught without a full choice of mugs. Do I have a problem? YES I DO. But sometimes doesn't IG make you want to buy stuff? Most of the time I'm able to quash it but I knew the mug was going to get to me. I remember hunting down that Cath Kidston Jubliee mug like it was big game! Phew. I have a cool mug. It was a tough choice, just look here at all these options! My mug is by Dunoon but there are plenty of fantastic mugs out there. I'll be chugging some coffee out of this one later. I mean tea. Come on. 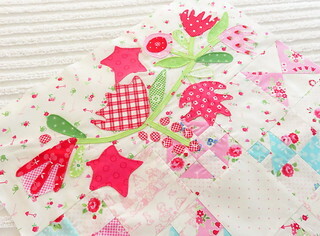 More sewing done this week, pretty excited to have all the applique done on my Scrapbasket Sampler. I thought about doing the majority of the applique without sewing the border onto the body of the quilt, but in the end I attached it so that I could make sure I was happy with the layout. Some of the pieces overlap into the first row of blocks. It does make blanket stitching more challenging but not impossible. For a few minutes I thought I was done but then remembered there were side borders. So close. Wednesday I went over to my mother-in-law's with my Easy Addition blocks. Doris has a big floor space and plenty of patience to make sure that all the blocks are laid out without two matching pluses ending up next to each other. So those are all in a pile and I'll start sewing rows together. Hopefully it will go together easily. Wow you have been so productive! 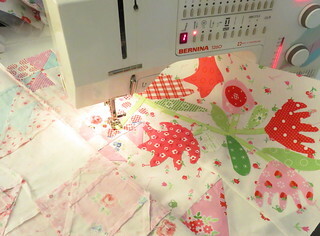 I am hoping to make a pile of Sweetpea pouches today to take to a little sewing gathering next week. And to finish cutting out a number of Easy Additon blocks to sew up that day. Finally 5 days home to sit and play...oh and now hunt down a Queens Birthday mug! 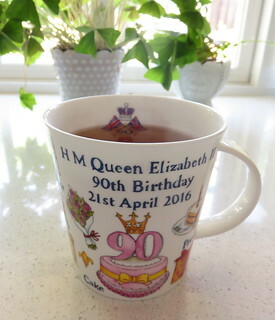 I'm thinking you were lucky to get a mug that celebrates the Queen's 90th birthday. But then you always have the best mugs. Your Scrapbasket Sampler is turning out so pretty. Can't wait to see it finished. I have a birthday dress to work on tomorrow. This week I finished up my curtains for my little blue and white trailer that I had started so long ago. They are made from the first Pam Kitty Morning line. I just still love that fabric.